Cupcakes 'n Daisies: No Sew Weekend . . .
No sewing for me this weekend. For the first time this year we had a full weekend with no rain. I spent the majority of my weekend doing a spring's worth of lawn work. 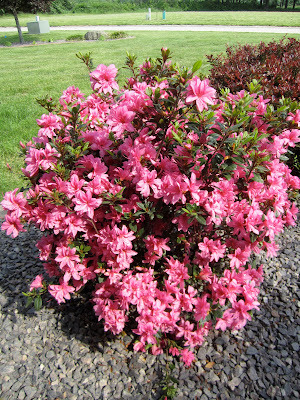 Here's one of my azalea bushes, they're finally blooming. I also swapped out a few quilts. Bounce is back in the house. And A la Mode is back on my bed. I just love having these summery feeling quilts back out. Have you been following the latest trends coming out of Spring Market in Portland, Oregon? I mainly followed through Instagram, but Kimberly from the Fat Quarter Shop has the best pictures I found online. (click here to read all about it) From the outside looking in, it looks like Market is one big party with everyone having nothing but fun. One thing from Market that caught my eye was this is Fig Tree pattern, Sweet Caroline. I'm moving it to the top of my basket To Do list. I'm not sure what fabric I'll use for my version, I know I won't be using Fig Tree fabric since that's what I used for A la Mode, the basket quilt currently on my bed. 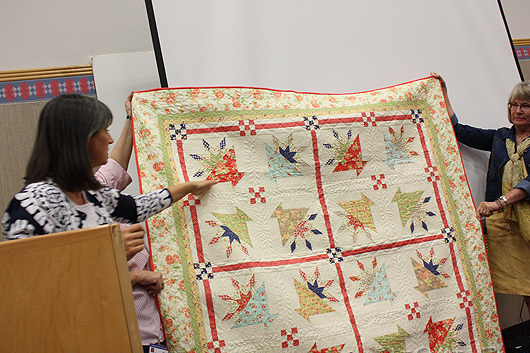 Kimberly at the Fat Quarter Shop shared this photo of Joanna unveiling the quilt at Schoolhouse. Unlike most things at Market that aren't available for months, this pattern is available now, click here. I'm hoping to get back in my sewing room today, the rain is back. Rainy Mondays never get me down! Your Azaleas are gorgeous. You can send some of that rain our way. We really need it!! You'll love Sweet Caroline. I was lucky enough to piece the version in your photo...and I too, can't wait to remake it...I just can't decide on fabrics! ya for sunshine. I haven't been sewing much lately either because of the garden....I can only do one hobby at a time. I hope more plants will bloom this week, we are so late this year. I still love your A La Mode quilt. You should see our yard right now. It rained for the better part of yesterday and its now a swamp around our house. Sweet Caroline is a winner for SURE! Went on Joanna's site and grabbed one for myself. Thanks for pointing it out. Love that Sweet Caroline! Was eyeing it in another post I saw, but I love Fig Tree although someone mentioned it in French General and I think that would be very cool too! I really love your A La Mode quilt. You've inspired me to order the pattern.